When squash season comes around the bend, it truly feels like summer. I end up coming home to my kitchen with baskets full of all types of varieties. But when it comes to actually cooking them, I never really want to do much at all. When the ingredients are beautiful, as is always the case with any farmer’s market variety of yellow squash come July, I usually just prepare a very simple dish with olive oil, a hit of lemon or vinegar, good salt, and a fresh herb, torn or chopped rustically, to give a brightness to the dish. Below are two recipes (or preparations, rather) that I’ve used for my summer squash so far this season. Roasting makes the squash slightly crispy, dense, and intensely squash flavored. Sauteeing them gives them a delicious silkiness. You can use any herb you want, but I always find that basil screams summer like no other. Arrange the thinly sliced squash on a baking sheet. Season with salt, drizzle with olive oil, and toss together so all the pieces are evenly coated. Spread as evenly as possible (there will be some overlap) and place in the oven. Bake until golden brown and crispy, about 20 to 30 minutes. Arrange on a plate and season with coarse salt. Using your thumb over the bottle top, drizzle a little balsamic over the chips, and garnish with some torn fresh basil. Serve as finger food with toothpicks or as a side dish. In a large Dutch oven or sauté pan with a lid, heat the olive oil over a medium flame. Sauté the onion until translucent. 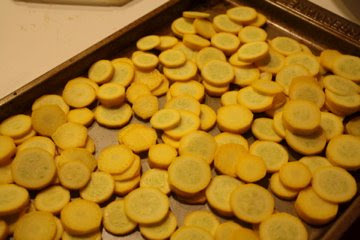 Add the squash, season it with salt, and continue to cook, covered, stirring occasionally, until it begins to soften. When the squash is nearly done (soft, but not falling apart), add the basil and stir to combine. Taste for seasoning, and serve warm. 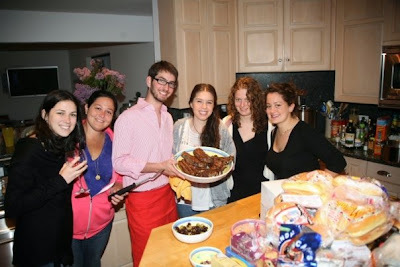 I had a small, daytime housewarming party late last October, when I was finally settled into my new apartment. I served a breakfast burrito buffet, which always goes over fabulously well. Since everything but scrambling the eggs and heating the beans and tortillas can be done so far in advance, I decided that I’d use every last resource in my new, tiny kitchen the morning of the party. It was fun to make unexpected aspects of the meal from scratch, and I had time to clean up before everyone arrived. I’m pretty sure that I found a cooked salsa recipe in one of the beloved Moosewood cookbooks originally. I may have even followed it for that burrito buffet housewarming brunch. It’s nearly the same ingredients as a classic tomato sauce made from canned tomatoes, but you use cilantro instead of basil, and instead of carefully caramelizing the onions and garlic to a toasted golden brown, you basically stir fry them, so they maintain their crunch in the finished salsa. In the photo below, you can see the batch I made for a dinner fajita buffet—we grilled chicken and striped bass, but otherwise the components were the same as for breakfast. This time, however, the seamless advance preparation almost turned to disaster. I knew I was going to have to make the salsa in two steps, since we hadn’t yet made the supermarket run for cilantro, lime, and chiles. But then I slightly over-softened the onions and mistakenly opened cans of tomatoes that were already flavored with basil. When I tried the salsa it tasted like tomato sauce. After going to the supermarket though, I minced lots more garlic, toasted several jalepenos, chopped up an entire bunch of cilantro, squeezed the juice out of three limes, and my Italian pasta sauce became a (cooked) Mexican condiment. It was a peculiar moment in taste transformation, but it made me realize just how experimental you can get. The size and flavor of your tomatoes and your hot peppers matter a lot; how long you cook and cool the salsa for matters too. Then there’s the concept of adding fruit, beans, or corn. Start thinking about other fresh herbs, and you’re on your way to salsa infinity. In a large saucepan heat the oil over medium-high heat. When the pan is quite hot, toss in the onions. Stirfy for a minute or two, then add the garlic and jalepeno and stirfy a minute or two more. Everything should have become slightly more translucent but should by no means be cooked through. Add half the cilantro, let it wilt, then add the tomatoes. Bring the whole thing to the boil and simmer for 20 minutes. Add the lime juice, taste for salt, and let cool to room temperature. Refrigerate for 1-2 hours, until chilled. The salsa will keep 1-2 weeks in an airtight container in the fridge if you don’t eat it all, straight from the spoon, before them. 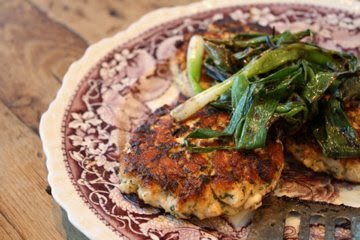 The idea for these Asian-influenced salmon burgers came to me when I was thinking of what to do with a leftover knob of ginger. I had never made fish based burgers before, and I was a little wary of my audience–when opting for a home cooked meal my parents don’t usually eat Asian or burgers–but decided I could rely on unconditional love to make this meal a success. After both plates were clean (even my mom’s), my parents asked if I would make the salmon burgers again the next time I cooked. Success indeed. Whisk together the mustard, mayonnaise, ginger, garlic, lemon juice, and cilantro. Season with salt and a pinch of cayenne. Taste for seasoning, and add more heat if necessary. Finely chop the salmon filet. 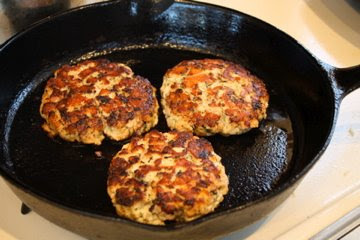 Toss together with the mustard mixture and form into four even patties, making sure to pack the rounds together as tight as possible. Place burgers on a plate, cover with plastic wrap, and chill in the refrigerator for at least an hour, and up to six. NOTE: you can make the sauce the night before, but don’t add the fish until the day of. The acid in the lemon juice will cure the salmon like a ceviche if combined for a long period of time. Heat a nonstick skillet over a high flame and coat the bottom with a thin layer of olive oil. 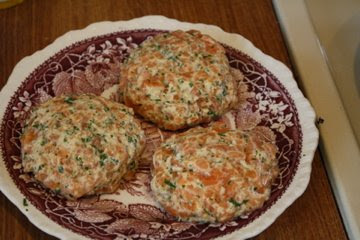 When the pan is very hot, add the salmon burgers. Cook the burgers until brown and crispy on both sides. Make sure not to flip the burgers too early—they are fragile and need to be nearly cooked through on the first side in order to turn without breaking. In the meantime, heat a grill pan over high heat. Drizzle a little olive oil on a large plate and roll the scallions around until they are coated with oil. When the pan is hot, add the scallions. Rotate as necessary until the green stalks have wilted and the white stems have beautiful dark brown grill marks. Serve the burgers, with or without toasted buns, and pile the grilled scallions on top. Sometimes, when people with approaching birthdays say, “Nah, I don’t want a party,” they mean it. But usually they don’t. 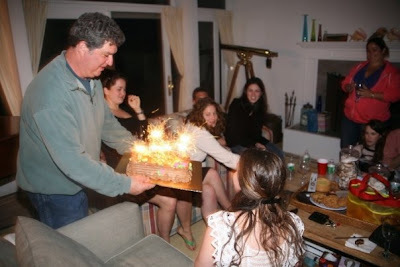 Our friend Sarah was turning 24 on the 24th, and though she kept claiming she wanted to keep things mellow, the”small party at her parents’ beach house” quickly devolved into a the-more-the-merrier, all-night Memorial Day event. 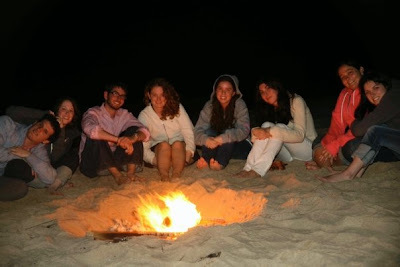 There were fireworks on the beach and later a bonfire, 20 enormous Levain cookies in addition to a cake, and 25 guests who just happened to have been milling about the neighborhood. Though Sarah may have been in denial about her deep-seated desire to celebrate her golden birthday (dorky, yes: 24 on the 24th…), she is not a space cadet, and she quickly realized that to feed all 25 of her family and friends, she’d need to be spectacularly organized. To that end, her brother Daniel got put in charge of the meat, her father took care of the seafood and her mother the pastas, Sarah herself was on tofu duty, and I volunteered to bring over an appetizer tray. The Sunday of Memorial Day—unlike the clear, fireworks-friendly night that followed it—was somewhat gray. I alternated sleeping and reading all morning, but then sometime after lunch it occured to me that I’d prefer cooking all afternoon to doing pretty much anything else. So I embarked on an hors d’oeuvres platter to end all hors d’oeuvres platters, because, well, why not? If Sarah was going overboard, I might as well too. Half the tray was made up of various experiments in phyllo dough; on that, more soon. The homemade crackers are the recipes I’ve given below, and they’re really a great stock hors d’oeurves to be able to make. For one, they satisfy the baking urge without producing a dessert, and for another they appear to have required that extra effort that makes people exclaim that they can’t believe you made them by hand. Each recipe makes about 24 crackers. 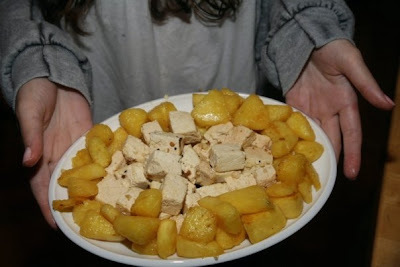 For both crackers, combine all the dry ingredients in a small bowl and mix well. Add the fat—using your fingers to mix in the butter if you’re making the Parmesan Sesame Crackrers. Finally, stir in the egg. Roll the dough into a log about 12 inches long. Wrap well in plastic wrap or foil and refrigerate until firm, at least one hour. When ready to bake, preheat the oven to 375°F. Slice the cookies about 1/4 inch thick and arrange them on baking sheets. Bake until golden around the edges, 10-12 minutes. Serve alone, with cheese, hummus, or other dips. Kate’s parents have a house up the Hudson in New York, and since they were spending a weekend not on vacation there, Kate and her brother invited us up. A group of nine wide-eyed, country-bound city folk, Kate made sure we were as entertained as campers. Waterskiing, card games, long walks, runs, bike rides, and a tennis tournament counted among the planned activites. Among the unplanned: getting hopelessly lost on the way back from waterskiing, taking a random two-hour nap on Saturday afternoon (that would be me), and having to feed partially cooked DiGiorno frozen pizza to a certain pair who had managed, on the train, to swill all three of the bottles of wine they were bringing to Kate as a gift. Anyway, after all that activity, we obviously grew hungry. Kate’s mom, Barb, is an awesome cook (and her kitchen is huge and well-stocked dream), so there was a lot to live up to. A few farmstand runs were supplemented with a supermarket excursion on Saturday around 7pm, which, of course, all nine of us felt compelled to go on. And then we dished out the cooking tasks, so everyone had their hand in making the meal, or at least setting the table—and then everyone also got to bask in the glory of an excellent, al-fresco feast. As for the muffins, which I made on my own early Sunday morning—well, it was a team effort to eat them! You can make this dish with pretty much any veggies you have on hand. I like what the roasting does for the broccoli and asparagus, but you can add them to the sauté if you don’t feel like turning on the oven. Keep in the leafy greens—spinach and arugala—if you can…they’re really good with the pasta. Preheat the oven to 350°F. Toss the asparagus and broccoli with 1 tablespoon of the olive oil and roast for 30 minutes, until cooked through and brown. Sprinkle with salt. Meanwhile, sauté the onions and garlic in 2 tablespoons of olive oil in a large pan over low heat. When soft, add the carrot and the spices. The sauce can be made up to this point ahead of time. When you’re nearly ready to eat, bring a large pot of heavily salted water to the boil. Add the pasta and cook as instructed on the box. As the pasta is cooking, scoop out about 1 1/2 cups of water. Add 1/2 cup of pasta water to the sauteed veggies, along with the broccoli, asparagus, and greens, a minute or two before you drain the pasta. Drain the linguine and add to the saucepan (if it fits—otherwise do this step in the serving bowl). Add more reserved pasta water if it seems dry, then add half the Parm, taste for salt, and serve. Offer the rest of the cheese on the side. This was a fairly intimidating part of the meal, since Nick, Kate’s brother, runs the Midtown salad institution, Just Salad. Melissa, his girlfriend, took care of roasting the chickpeas, which gave everything a delightful crunch. Preheat the oven to 300°F. Drain the chickpeas really well and use paper towels or dish cloths to dry them completely. Toss with 1 tablespoon olive oil and the spice mix, then spread on a baking sheet. Toast for an hour or longer, until they’re crisp, being careful not to burn. At the same time, slice the tomatoes from the can into 1/4″ pieces. Sprinkle with the other teaspoon of olive oil. Toast for about 1 1/2 hours, turning the pan and flipping the tomatoes if edges seem like they might burn. About halfway through sprinkle with the brown sugar. Compose the salad by arranging the chickpeas and tomatoes on top of roasted greens. Make a vinaigrette, or simply dress with olive oil, vinegar, and salt. Kate took charge of the yogurt. It makes a great light dessert—and also holds its own as a late-night snack. Put all the ingredients in a food processor container along with a couple of tablespoons of water. Process until just pureed and creamy, stopping to scrape down the sides of the bowl as needed. If the fruit does not break down completely, add a little more water through the feed tube, a tablespoon or two at a time, being careful not to over-process or the sorbet will liquefy. Freeze for at least an hour or two, until firm. Serve topped with fresh berries. *I used about 1/3 cup each of dark cherries, raspberries, and blackberries. Preheat the oven to 375°F. Grease a 24 cup mini-muffin pan very well. Combine the melted butter with the sugar. Beat in the eggs and vanilla. In a separate bowl, stir together the flour, salt, soda, and powder. Fold it into the wet ingredients using as few strokes as possible. When it’s nearly combined, gently fold in the berries. Divide evenly among the muffin cups. Bake for 15-20 minutes, until the muffins have risen and are golden, and the top of a muffin bounces back when you press on it. I made this soup for the first time a few weeks ago after a long day of fried food and outdoor activity. I was ready to hunker down for a night home alone and, too tired to even lift a spoon to my mouth, was wishing there was some way to magically inject some green into my system. The soup (out of a mug) was a delicious solution. The next afternoon I went to finish off the remaining bowl and, as I was about to put it in the microwave, I snuck a spoonful. The lemon, ginger, and herbs were so flavorful and refreshing cold, I ending up polishing off the remaining spoonfuls while standing in the kitchen. This makes a great summer soup served chilled, especially on a sunny afternoon. Heat 2 tablespoons of olive oil in a stockpot over a medium-high flame. Sautee the shallots, garlic, and ginger until the translucent and fragrant. Add the peas and stock, season with salt and a few dashes of cayenne pepper, and bring to a rolling boil. Simmer for 5 minutes, then turn off the heat, and add the basil. Puree the soup in a food processor or blender. Taste for seasoning, and add more cayenne if you want a kick. Cool in the freezer or refrigerator. Before serving, add the lemon juice. If you add it too early, it will cause the basil to brown and your soup will look less appetizing, if just as delicious. If serving to a fancier crowd, pass the soup through a strainer. If you puree well enough, this will be mostly unncessary. Serve with a dollop of sour cream or crème fraiche mixed with a little basil.